An inter­est­ing — if not ful­ly inte­grat­ed — exten­sion. 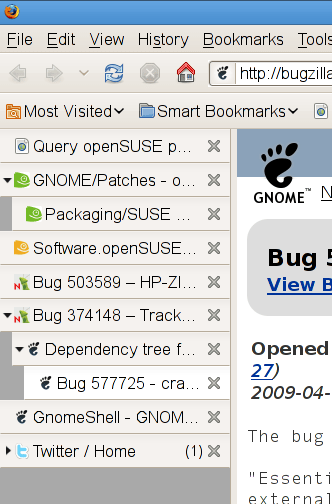 Too many options, mess­es with the default tab order (when clos­ing tabs, etc.) but orga­nized and unclut­tered, even with twice as many tabs open. It’s not too often I’ve seen a Fire­fox exten­sion that real­ly changes the way I (can) oper­ate. I’ll have to wait until I get home to post a screen­shot, but my tabs look even pret­ti­er than that (and that is pret­ty enough!). I don’t know if it’s my theme or com­piz set­tings or what, but I get nice fan­cy shad­ows and every­thing. I’m con­vinced now.